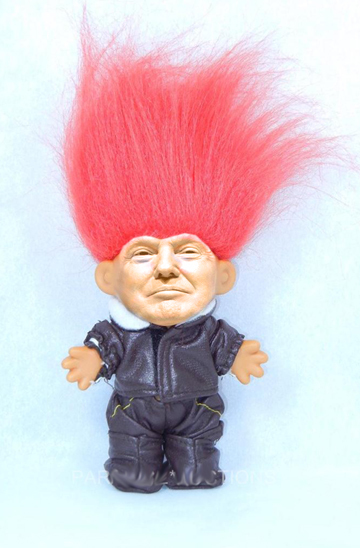 ...and today it's a human troll doll. Nice work Repugs -- you're doing your best to make people embarrassed to show interest in politics. I saw the headline that told me "the Donald" had decided to run for POTUS again. Some of the clowns have more money than they'll ever be able to spend, so he may as well toss a huge pile of cash on a useless, idiotic quest for an office he can never hope to buy. I say that as he is nowhere rich enough to do so. As to lil' Jindalski, I think he may be looking to take over for old Pat Robertson and the "700 stick/club". Lamar White had an article posted at Slate that sort of hinted at something like that. Sorry, I don't have the link to it. Jindal is making sure as he can that this state is in ruins by the time he leaves office though. Louisiana, what a state. Many have said he is THE absolute worst governor ever for this state. That is really an accomplishment seeing as how more than a few former governors and other high elected officials from Louisiana have done serious prison time. Have a great week, we may get some sunshine up here for a day or three in the coming days and next week even. Best to you and Tigger too. P.s. For the record, Winnie THER Pooh and friends was my first literary hero. Tigger was one of my favorites. Funny, but true: as a kid I lived in Virginia, and we watched the Jim and Tammy show on channel 27, WYAH -- yep, Robertson's flagship TV station. What did we know? We were kids and they ran cartoons. Anyway, my older sister mailed a letter to them and we got "free tickets" to see the show...hahaha. I would have gone, too, except that we took a Loosiana vacation (we did that every year to see mom's family). No loss, though it could've been a funny story to tell...Jim and Tammy Bakker. Yikes. Well...busy day again, so I'll cut this short and get on to my evening. Take it easy. Various Pooh books were among my earliest reads...but Tigger was already named when I brought him to the house. Probably just as well. Otherwise, his name might be OC...as in Orange Cat.